This article may contain outdated information that is inaccurate for the current version of the game. It was last updated for 1.9. 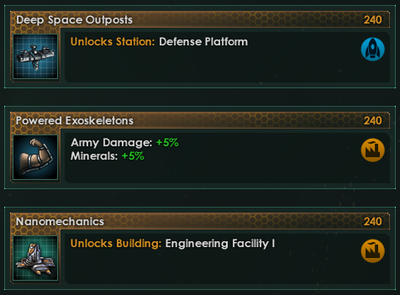 Technology in Stellaris is divided into 3 research areas with each area corresponding with one of the research resources: Engineering, Physics and Society. Additionally, each of the ~300 techs belongs to one of 12 subcategories divided between the areas (most appearing pre-dominantly in one area though not exclusively). The user interaction aspect utilizes a card shuffle approach rather than a traditional tech tree presentation, thereby introducing an element of semi-randomness into the system. Technology interface. Every slot here can have one research project active at a time and every research area has its own slot. There are three different main research areas in-game, with each area corresponding with one of the research resources. Additionally, each research area has multiple subcategories, for a total of 12 such subcategories, and every tech belongs to one of these subcategories. Industry: Mineral production and storage, robots, building construction. Propulsion: Kinetic and explosive weapons, thrusters. Voidcraft: Ship types and hulls, starbases, strike craft. Computing: Science Labs, research, science ships, ship computers, point-defense, sensors. Field Manipulation: Power Plants, shields, some strategic resources. Particles: Ship reactors, energy weapons, FTL, some strategic resources. Biology: Food production, leader lifespan and policies, species modification, army types, some strategic resources. Military Theory: Fleet command limit, naval capacity, army buildings and statistics, claim cost. New Worlds: Tile blocker clearance, terraforming, starbase capacity, administrative capacity. Statecraft: Unity, edicts, leader pool and recruitment, planetary and empire capitals. Psionics: Exotic mid- to late- game technologies. Unlocked through the Psionic Theory technology. This section may contain outdated information that is inaccurate for the current version of the game. The last version it was verified as up to date for was 2.0. The "card" system. Every time a research project is to be initiated, the game will draw a hand of cards like this one from which the player then can pick one technology to research. Although the underlying technology system is based on the familiar tech tree structure, it does away with its standard interaction/presentation in favor of the card shuffle approach. This injects a semi-random element into research, making it somewhat less predictable as well as more non-linear. Whenever the player is prompted to initiate a research project, the game gives them a "hand of cards" consisting of a semi-random selection of technologies available for research which are picked randomly from a hidden "deck of cards" consisting of all valid research options that can appear. Tiers - Technologies are divided into 6 levels (T0 to T5) of advancement. Higher tier technologies require obtaining a certain number of technologies from the preceding tier in the same area of research (set at 6 for all tiers) before they become available as research alternatives. Weight - A base value denoting the relative chance (out of all the valid options) of a particular technology to be drawn as an alternative. This may be further modified by an empire's composition (ethics, civics, and etc.) 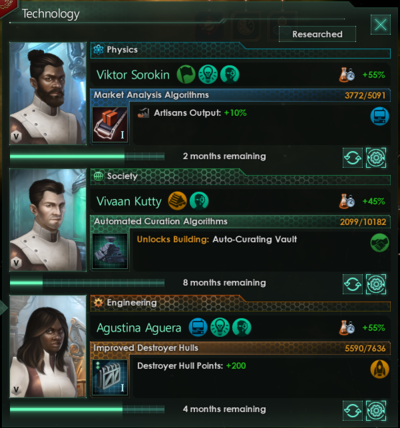 and its current state (scientist's traits, past tech, and etc.). To further increase variation, a tech which appeared as an alternative in the previous card hand will have its weight set to 0 in the next prompt. As a general rule of thumb, the more advanced a technology is, the lower its weight (and the higher its cost). Let's assume the game draws a card hand of 3 techs: Armored Torpedoes, Autocannons, and Orillium Extraction. Additionally, the lead engineering scientist has a Propulsion field expertise and the previous card hand had Autocannons as an available option. If a tech were to be picked at random, then each tech's chances of being drawn would be 28.7%, 12.3%, and 59% respectively. Note: Tiers, weights, and what modifiers affecting it are hidden parameters. That being said, an expertise in a tech's field is likely to increase its weight (and therefore appearance). Additionally, some research cards may be gained as permanent alternatives. They appear below the regular alternatives and are distinguished from them by a golden border surrounding the tech card's bezel. These alternatives are usually acquired (along with some partial progress) through post-battle debris analysis, from special projects or event chains. These options will always appear as available options when drawing a new card hand and will remain as such until completed. If need be, it is possible to change an on-going research project at any point - without incurring penalties - in order to continue researching it at a later time. It is important to note, however, that the saved progress does not scale with changes occurring to technology costs (for better or for worse). This tends to lead to the tech's completion percentage getting lower as the empire continues to expand. As opposed to a permanent alternative, there is no guarantee that the technology in question will appear in the next card hand drawn. This section may contain outdated information that is inaccurate for the current version of the game. The last version it was verified as up to date for was 1.9. Each research area employs the use of a different research resource. Each of these individual resources has a base production of 5 research points a month. This can be further increased by pops working the appropriate jobs, constructing research facilities on planets or research stations on the galactic map. The following table may contain outdated information that is inaccurate for the current version of the game. The last version it was verified as up to date for was 1.9. Research output which is not being used for research at the time is being accumulated as stored research. Alternatively, it may also include research resources gained from other avenues such as debris analysis, anomalies, events, and etc. This method allows for a more "relaxed" research by eliminating the loss of research points due to forgetting to pick a research project while, at the same time, also simulating accelerated periods of research (as opposed to sudden "jumps") caused by newfound knowledge sources. The current storage levels can be seen by hovering over the appropriate resources. An empire produces +24 Engineering research a month and has just finished debris analysis granting it +1000 Engineering research (stored research). The empire will supplement its Engineering research by an additional +24 research points for the first 41 months and by another +16 research points in the following month, after which the Engineering stored research bank will completely deplete. Research speed represents a given expertise in a particular research area or field leading to shortened research time of related technologies. The most immediate sources of research speed modifiers are the 3 lead scientists. As the applied bonus depends on a scientist's skill level and overall traits, it is recommended to assign newly recruited scientists to command a science ship. Scientists on exploration duty tend to gain experience faster and, if one is in luck, they may also gain a new trait beneficial to research while leveling up. An empire is a Materialist and produces +24 Engineering research a month. It has a lead engineering scientist with a Propulsion field expertise while researching Armored Torpedoes. Note: A research area without an acting lead scientist receives a penalty to research speed. This section may contain outdated information that is inaccurate for the current version of the game. The last version it was verified as up to date for was 2.1. As a game progresses, research option choices will begin to include progressively more advanced and correspondingly more expensive technologies. Each technology has a base cost associated with it which scales in relation to the empire's size - number of colonized planets and owned systems. This means that while overall an empire's research capabilities will increase with additional planets and systems, it will do so with increasingly diminishing returns for every new addition; Meaning, a larger empire will have to invest more resources than a smaller one to gain the same tech. This allows for empires of a somewhat differing size to keep a "relative" technological parity. An empire is researching Global Energy Management (750 base cost). Aside from its home system, it owns 2 other systems and 1 colony. Note that an empire's capital does not count towards the total number of owned colonies or systems in the formula. While it is possible for the monthly research progress to remain constant during the course of researching a certain technology, it is more than likely to fluctuate - for better or for worse - due to consequences of various actions (such as exploration, empire development, expansion, etc.). This, in turn, may increase or decrease the total research time of a given tech. The empire from the previous examples (same setup) has just finished debris analysis granting it +10% research progress in Armored Torpedoes along with +1000 Engineering research (stored research). Note: Partial research can refer to debris analysis, previous research, event rewards and etc. ↑ See /Stellaris/common/technology/tier/00_tier.txt for details. ↑ See /Stellaris/common/scripted_variables/00_scripted_variables.txt for details. ↑ See /Stellaris/common/strategic_resources/00_strategic_resources.txt for details. This page was last edited on 17 April 2019, at 14:08.